My costume is an Alice In Wonderland and Cheshire Cat mash-up costume (I’m the one wearing the costume and I made it). 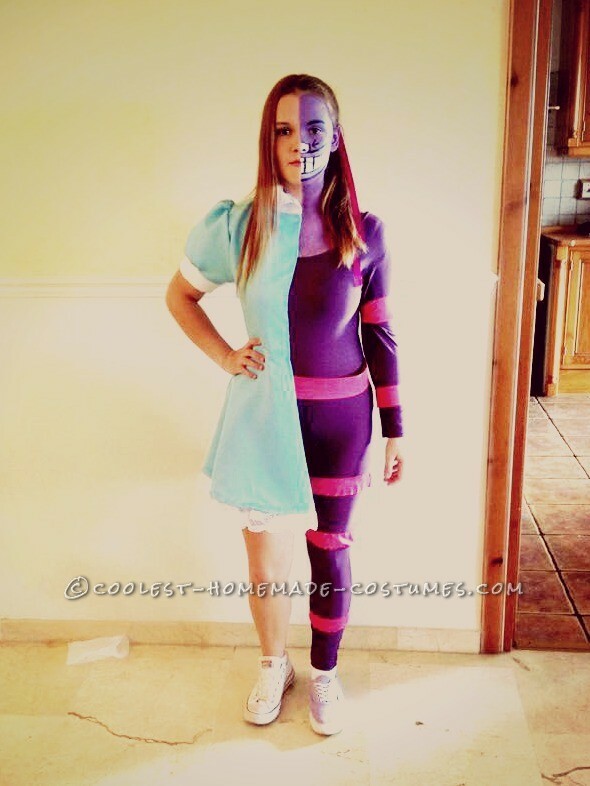 I was inspired by a dance I’d seen with one person as the Cheshire cat and the other as Alice, and it inspired me to get creative and create a costume no one in my town had created before. I’ve never been one for scary costumes, and as I’d volunteered to help out at a kid’s Halloween party, I thought it was a perfect costume for me. So I set out on creating this costume and never having created a costume before, I was prepared for all the (blood!) sweat and time it would take in order to pull it off. It took me about two days to create this costume, putting in all my effort and focusing all my time on this one costume – having a broken sewing machine and sewing it all by hand didn’t help! My favorite part about making this costume was definitely as I was adding the final touches. I was finishing off my costume and I could see it in front of me. It had actually turned out very similar to how I’d planned it would! I was so proud of what I’d made and as I sat there finishing off the costume, I was overwhelmed with joy – my first ever homemade costume and I could actually be proud of it! Of course I’ve always enjoyed arts and crafts, but I’d never set out to make something this big before, normally it’s just the occasional pillowcase or pouch. Although it was time consuming, I absolutely loved making this costume and I’m already planning next years costume! Making this costume myself was also very difficult at times, as occasionally I had to put on the costume in order to ensure the material was in the right place, and as you can imagine, pinning the back of the outfit led to a few pin stabs in the back! Not a pleasant thing, but I think it was definitely worth it. I didn’t get to enter any competitions, but the response I got from people was amazing which is what inspired me to enter it on here! Everyone seemed to love my costume, and I was genuinely shocked that people loved it so much! Even though I loved it, I loved it for another reason – it was something I had made myself and could be proud of. I’m so glad that this got to be my first homemade costume as I hope to only get better from here! The next part of my costume making adventure was doing the seams. This is where having a broken sewing machine began to be a bit of a problem! Getting the seams to be straight AND look neat and tidy can be hard when you’re sewing by hand, but just take your time, don’t rush it and it’ll turn out pretty good! You fold in the ends of the material inside and sew it together so the material looks lovely instead of having pieces of thread everywhere and all the ends fraying. Next came the pinning, Oh the pinning! I wouldn’t advise making this costume alone as I did, because pinning the two sides of the materials together doesn’t seem too hard until you have to put the costume on to get the materials in the right place and the back needs to be pinned! I don’t think I can count the amount of times I got a pin to the back. So what you have to do is get someone you trust (a family member or friend) to pin the back for you – trust me, you’ll be grateful! What come after the pinning? You guessed it, sewing. I have a tip for this – make sure your sewing machine works! I made that mistake and I will surely never make it again. The costume can be sewed by hand, I managed to do it, but it doesn’t look as tidy as a machine makes it, although with patience it is possible to do it neatly. This part is literally what the title says, it’s sewing the material together. This is where you see the costume finally coming together in front of your eyes, and if you’ve never made any costumes or clothes before, I can tell you now that it’s a great feeling. So after having the costume on, I added the final touches. I did all the makeup myself copying a tutorial I found online. I then added a purple ribbon around my neck which went under the collar on the Alice side (I didn’t have it on for the photo unfortunately) and I wore two different shoes to match each side. I wore canvas shoes/trainers but you can wear any purple shoe on the Cheshire Cat side and any flat shoe on the Alice side – whatever you think is best. And there you have it, your homemade Alice In Wonderland/Cheshire Cat mash-up costume!